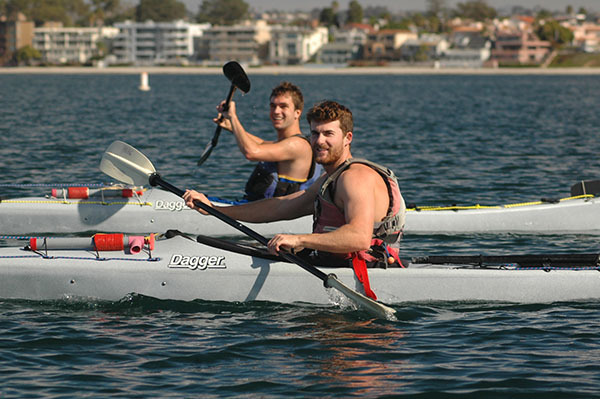 Mission Bay Aquatic Center is a great place to learn to kayak in San Diego. 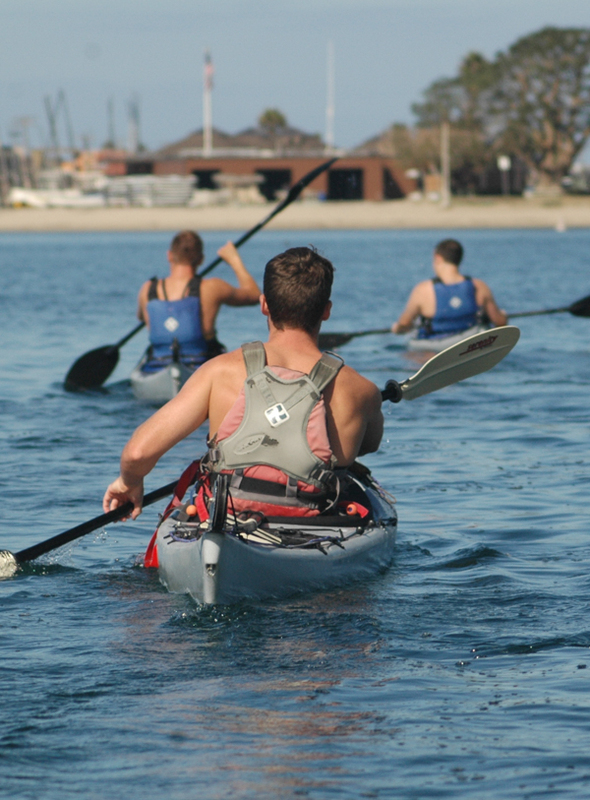 You will be able to learn how to kayak in the protected waters of Mission Bay. 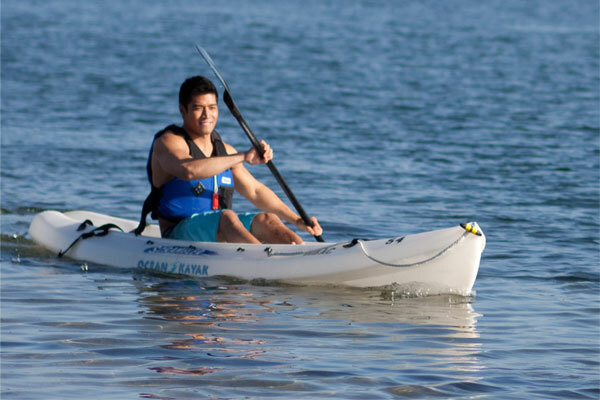 Our kayaking classes are progressive, starting with the basics and moving on to more advanced strokes and manuevers. 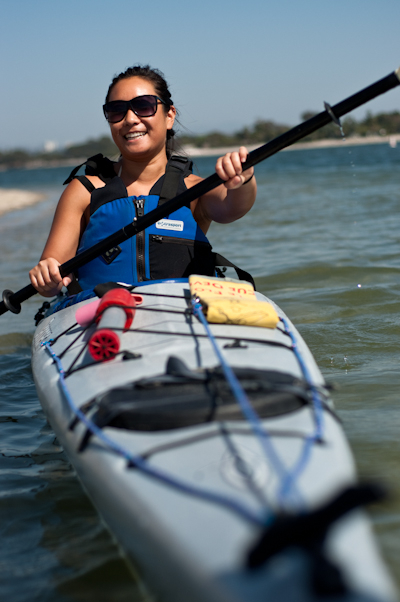 Our kayaking program provides many options of classes and instruction for all levels. You can start with basic kayaking fundamentals in our introductory kayaking classes, develop your skills in our advanced level classes, or take to the surf in a specialty clinic. We also offer tours and trips including a nighttime paddle under the moonlight. Whatever your kayaking skills or goals, we have the program for you! You can save with packages! This course is designed to help students become acquainted with the sport of kayaking in a calm and relaxed atmosphere. Students will practice maneuvers and learn to safely control a sit-on-top kayak while enjoying a guided tour of Mission Bay. 5/5/2019 1 Su 9:30AM-12:00PM Enroll! 5/18/2019 1 Sa 9:30AM-12:00PM Enroll! 6/1/2019 1 Sa 9:30AM-12:00PM Enroll! 6/9/2019 1 Su 9:30AM-12:00PM Enroll! 6/15/2019 1 Sa 9:30AM-12:00PM Enroll! 6/23/2019 1 Su 9:30AM-12:00PM Enroll! 6/29/2019 1 Sa 9:30AM-12:00PM Enroll! 7/7/2019 1 Su 9:30AM-12:00PM Enroll! 7/13/2019 1 Sa 9:30AM-12:00PM Enroll! 7/21/2019 1 Su 9:30AM-12:00PM Enroll! 7/27/2019 1 Sa 9:30AM-12:00PM Enroll! 8/4/2019 1 Su 9:30AM-12:00PM Enroll! 8/10/2019 1 Sa 9:30AM-12:00PM Enroll! 8/18/2019 1 Su 9:30AM-12:00PM Enroll! 8/24/2019 1 Sa 9:30AM-12:00PM Enroll! 9/8/2019 1 Su 9:30AM-12:00PM Enroll! 9/14/2019 1 Sa 9:30AM-12:00PM Enroll! 9/22/2019 1 Su 9:30AM-12:00PM Enroll! 9/28/2019 1 Sa 9:30AM-12:00PM Enroll! 10/6/2019 1 Su 9:30AM-12:00PM Enroll! 10/19/2019 1 Sa 9:30AM-12:00PM Enroll! 10/27/2019 1 Su 9:30AM-12:00PM Enroll! 11/16/2019 1 Sa 9:30AM-12:00PM Enroll! 12/7/2019 1 Sa 9:30AM-12:00PM Enroll! Advance registration required. Please register online using the Enroll link or call (858) 488-1000 to register by phone. Sea Kayaking Level 1 introduces kayakers to concepts and skills essential for coastal kayaking. Land and water instruction will help you learn to safely control a touring kayak. On the water practice will begin with students mastering the wet exit in a calm atmosphere. Students will then develop basic maneuvers while touring the coves of Mission Bay. Save $$ by purchasing this class as part of a package! See packages below. 5/4/2019-5/5/2019 2 Sa Su 9:00AM-12:00PM Enroll! 6/1/2019-6/2/2019 2 Sa Su 9:00AM-12:00PM Enroll! 6/22/2019-6/23/2019 2 Sa Su 9:00AM-12:00PM Enroll! 7/6/2019-7/7/2019 2 Sa Su 9:00AM-12:00PM Enroll! 7/20/2019-7/21/2019 2 Sa Su 9:00AM-12:00PM Enroll! 8/3/2019-8/4/2019 2 Sa Su 9:00AM-12:00PM Enroll! 8/24/2019-8/25/2019 2 Sa Su 9:00AM-12:00PM Enroll! 9/14/2019-9/15/2019 2 Sa Su 9:00AM-12:00PM Enroll! 10/12/2019-10/13/2019 2 Sa Su 9:00AM-12:00PM Enroll! 11/9/2019-11/10/2019 2 Sa Su 9:00AM-12:00PM Enroll! Sea Kayaking Level 2 covers procedures and techniques that will help you tour with confidence. The first day includes practicing recoveries in a calm and safe environment. Day two focuses on concepts that are essential for excursion planning and on the water practice of efficiency techniques. Prerequisite: Sea Kayaking Level 1 or equivalent. 6/15/2019-6/16/2019 2 Sa Su 9:00AM-12:00PM Enroll! 7/27/2019-7/28/2019 2 Sa Su 9:00AM-12:00PM Enroll! 9/7/2019-9/8/2019 2 Sa Su 9:00AM-12:00PM Enroll! 10/26/2019-10/27/2019 2 Sa Su 9:00AM-12:00PM Enroll! Join us for a unique on-the-water experience. 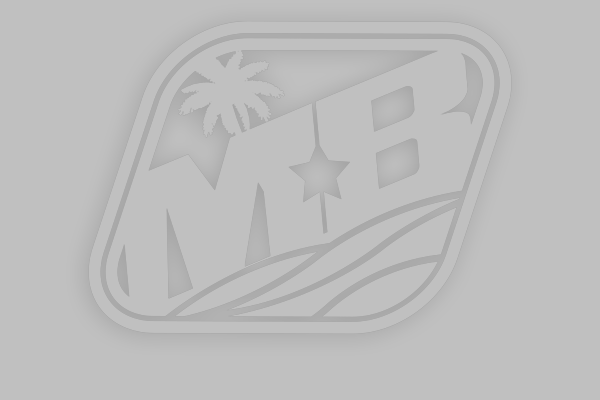 We will start with a short on-land skills session and then will launch for an amazing experience kayaking under the moon and the starts on the glassy waters of Mission Bay. 5/12/2019 1 Su 6:00PM-8:30PM Enroll! 5/17/2019 1 F 6:00PM-8:30PM Enroll! 6/15/2019 1 Sa 7:00PM-9:30PM Enroll! 6/16/2019 1 Su 7:00PM-9:30PM Enroll! 7/6/2019 1 Sa 7:00PM-9:30PM Enroll! 7/14/2019 1 Su 7:00PM-9:30PM Enroll! 7/26/2019 1 F 7:00PM-9:30PM Enroll! 8/4/2019 1 Su 7:00PM-9:30PM Enroll! 8/10/2019 1 Sa 7:00PM-9:30PM Enroll! 9/7/2019 1 Sa 6:00PM-8:30PM Enroll! 9/13/2019 1 F 6:00PM-8:30PM Enroll! 10/12/2019 1 Sa 5:00PM-7:30PM Enroll! 10/13/2019 1 Su 5:00PM-7:30PM Enroll! 11/10/2019 1 Su 5:00PM-7:30PM Enroll! Package price includes Sea Kayaking Level 1 and 2.